If you find something fun to do, do that as much as you can. If you find something meaningful in your life, do that thing as much as you can so you can fill your life with meaning, passion and purpose. I know there are some parts of your life or your job or your relationship with another person that you don’t like. And that’s okay. Everyone has that. But when it comes time to have fun, do that with passion and purpose and gave a great Monday! Keep on stepping towards your goals. Keep on getting those steps in. You have what it takes to reach your goals this week. Go do it!! You don’t need a new year’s resolution to make a new you. 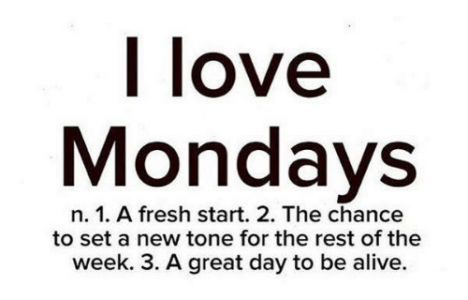 All you need is a Monday! Previous Post Who do you want to become? Next Post Happy Monday – RISE UP!